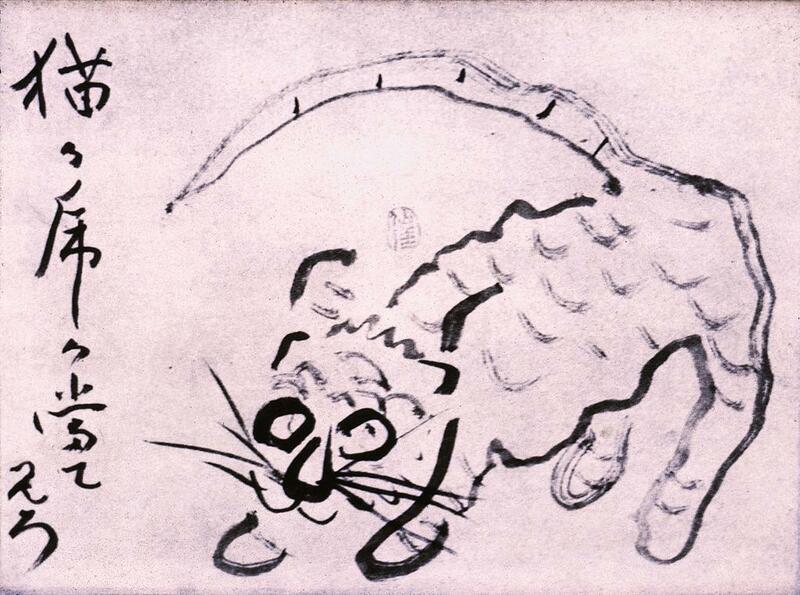 I was watching a mash-up rebroadcast of Antiques Roadshow the other night when a pair of Victorian calligraphic drawings suddenly appeared, including one very charming cat. You can see the appraisal–with appraiser Carl Crossman stating that he and his colleagues have seen plenty of calligraphic deer and eagles but few cats–here. Crossman loved the cat (and valued it at around $3500-$4000) and so do I, so of course I had to find one for myself. 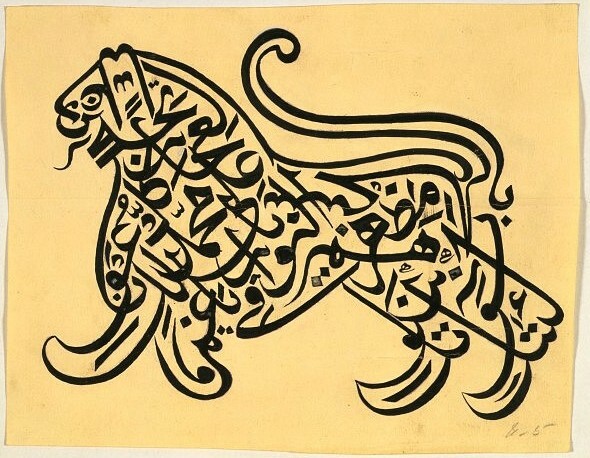 Calligraphy has always been a more integral feature of Islamic and East Asian art than that of the West, and I found some nice Asian BIG cats, but domestic calligraphic cats from Europe and America were indeed difficult to track down. Calligraphic Tigers from Japan (18th century) and Pakistan (19th century), Victoria & Albert Museum, London. 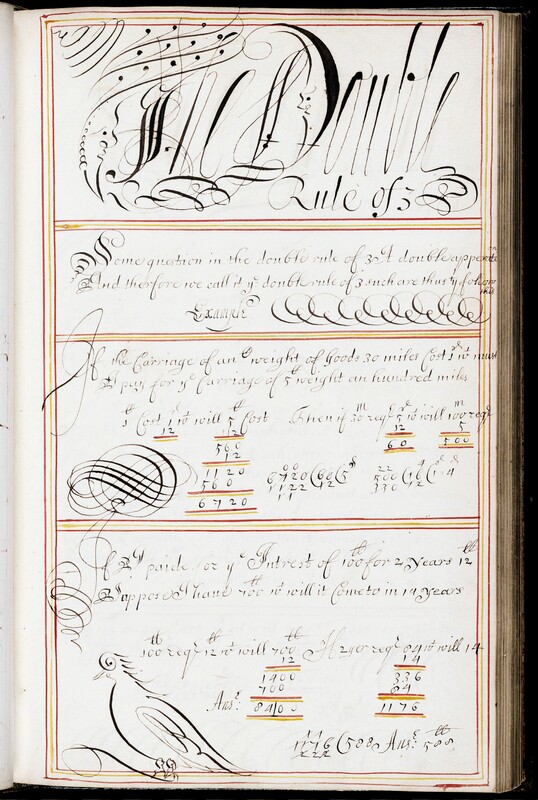 In the west, calligraphic drawings seem to emerge first in the general instructional workbooks of eighteenth- and nineteenth-century tutors and their students. 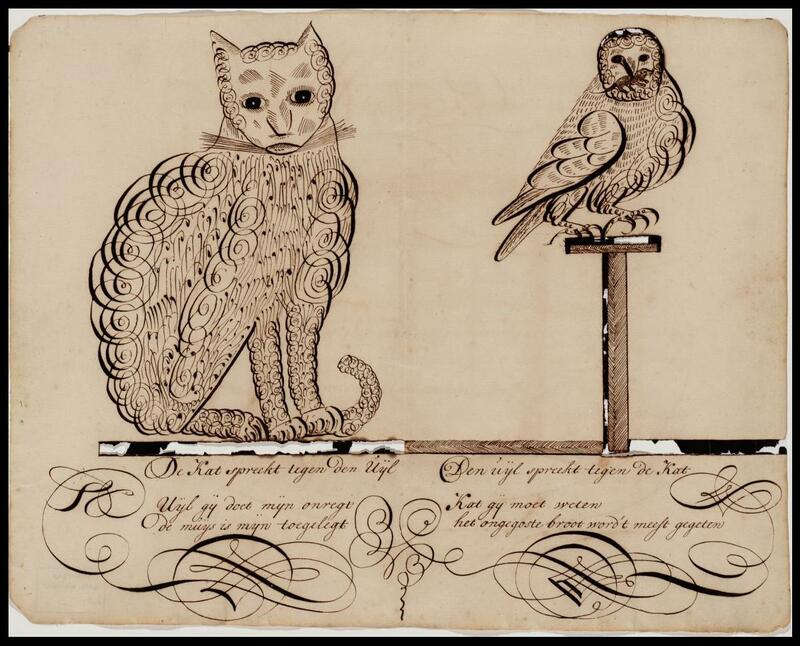 The owl and the pussycat below, which come closest to capturing the charm of my beloved Antiques Roadshow cat, were drawn by Dutch instructor Jacob Labotz for his students to copy and thus perfect their hands. So I started my search through the available instructional texts, starting with the later seventeenth century and working my way up to the later 1800s, when “flourishing” offhand calligraphy, combining writing and drawing, flourished. Mr. Crossman was correct: I found lots of birds (more doves than eagles), and no cats. “Mary Serjant her book scholler to Eliz Bean Mrs. in the art of writing and arithmetick”, 1688, Beineke Rare Book and Manuscript Library, Yale University. I expanded my search to include museum collections, antique-shop inventories, and auction archives and could only find more calligraphic birds, in addition to a few horses and donkeys, rabbits, the occasional dragon, and this wonderful elephant, produced in Ohio in the mid-to-late nineteenth century. I would have snapped it right up if it was not already sold. 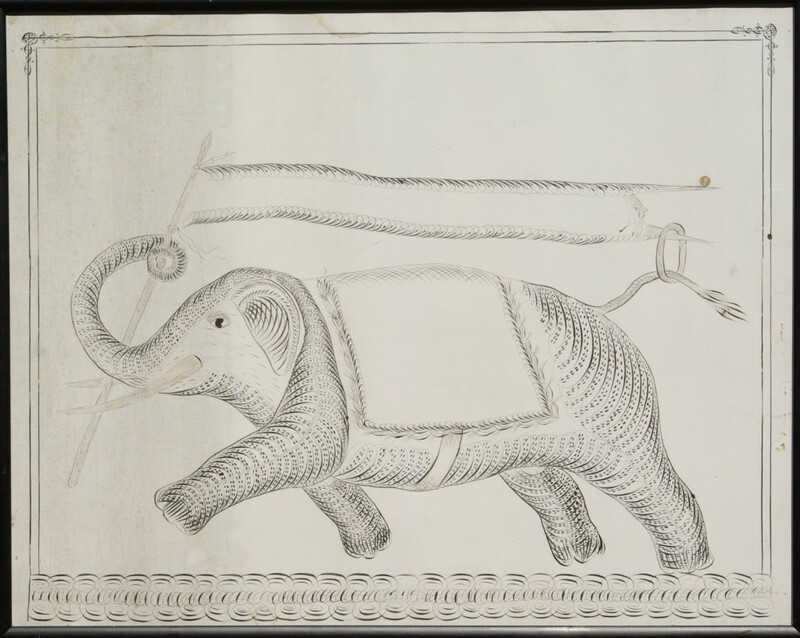 This elusive elephant inspired me to dig deeper and reminded me of an image that I do have: a calligraphic deer in the form of a John Derian tray: perhaps the source could lead me to a similarly drawn cat? Fortunately the Real Pen–Work. 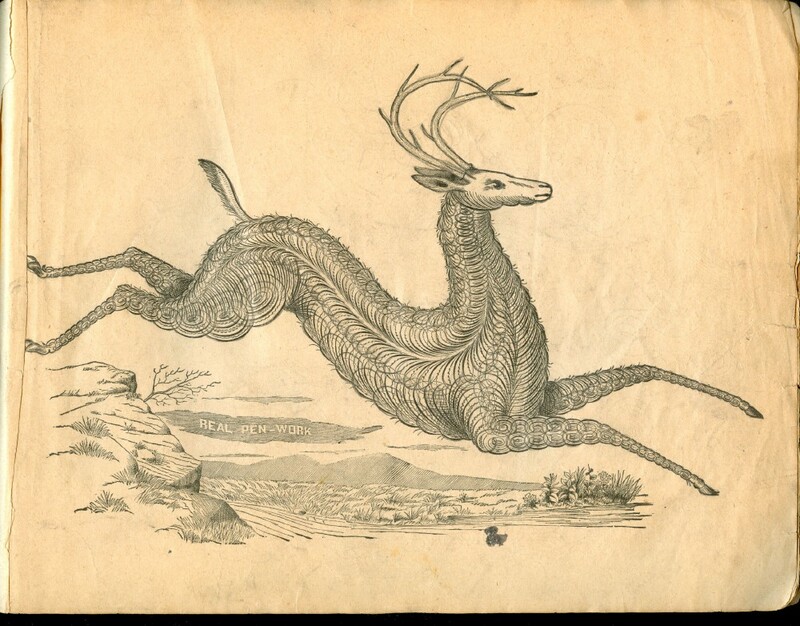 Self-Instructor in Penmanship (Pittsfield, MA: Knowles & Maxim, 1881) is available online: there I found my deer, along with flourished and fanciful birds of all feathers, fish, horses, and a big cat. 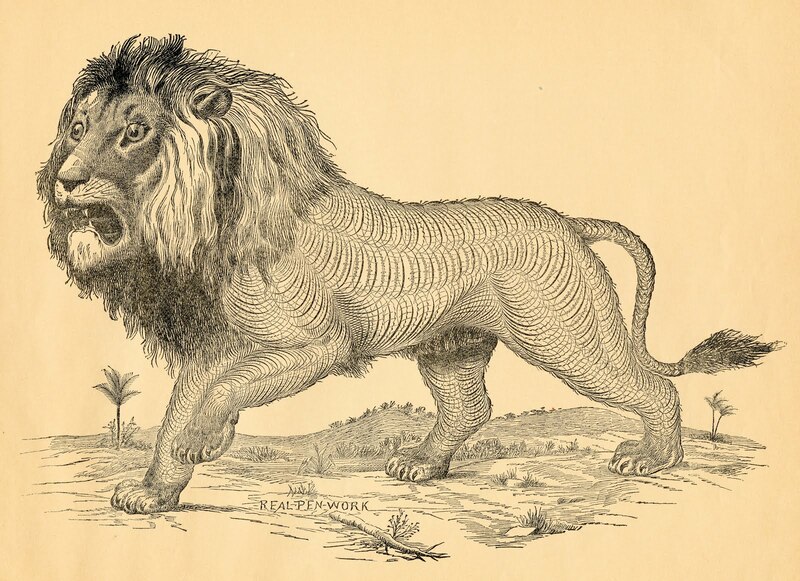 I’m going to keep looking for the perfect Spencerian calligraphic cat drawing, but in the mean time I think I’ll settle for yet another John Derian plate (I’m embarrassed to count how many I have), because this one comes very close to my feverishly-sought-after feline. Most of the courses that I teach focus on the period in which printing technology first emerges, so I am constantly assessing the influence of print on the Renaissance, the Reformation, and nearly every aspect of early modern society and culture. Consequently I have a particular and professional appreciation for the Smithsonian Institution Libraries’ digital exhibition Picturing Words: the Power of Book Illustration, which began its life as a “real”exhibition at the Smithsonian and on the road and then evolved into a virtual one. Ironically, I think most exhibitions that feature texts work better online than in rooms, and I bet this one does too: you can get closer to the images, for longer, and come to appreciate the influence they must have had in their own time, and their continuing power in ours. The images in the exhibition are organized into three categories, inspiration, information, and influence, with an additional section of pictures which illustrate the process of printing illustrations from Gutenberg’s time to ours. I think that all the images are well-chosen, but for the purposes of this post I am limiting myself to just five illustrations, with a few more for context. 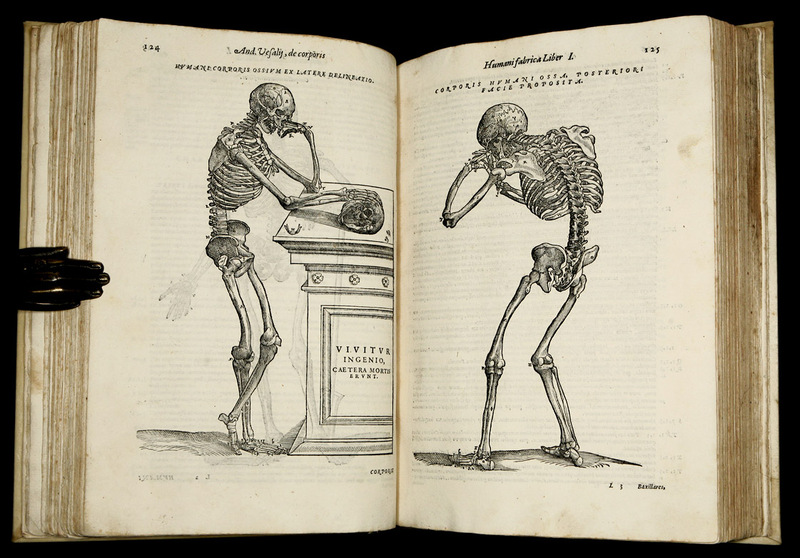 First up, from the Information column, a work I refer to often in all of my classes: the pioneering anatomical treatise by the Flemish physician Andreas Vesalius, De humani corporis fabrica libri septem, or “The Seven Books on the Structure of the Human Body” (1543). 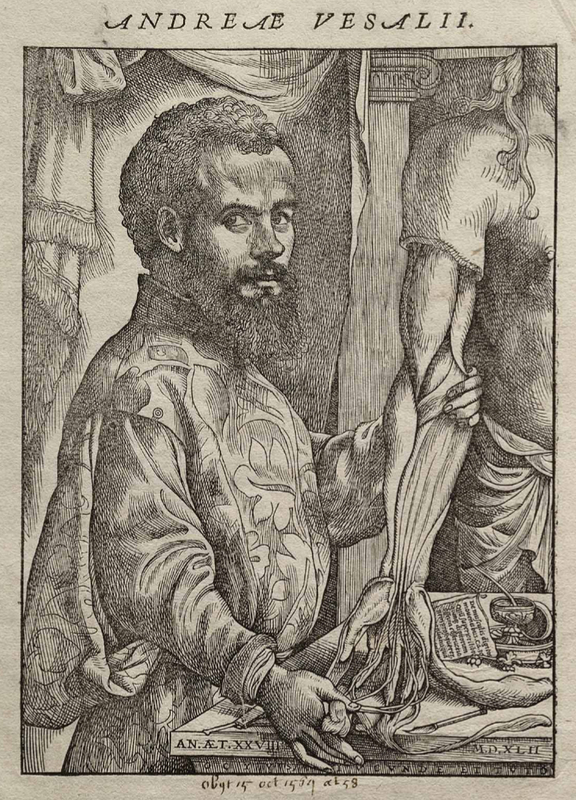 In the Fabrica, Vesalius took on authoritative Galenism with the help of draftsmen from Titian’s workshop: the result was a triumph for empiricism and a great example of the often-close relationship between art and science in the Renaissance. 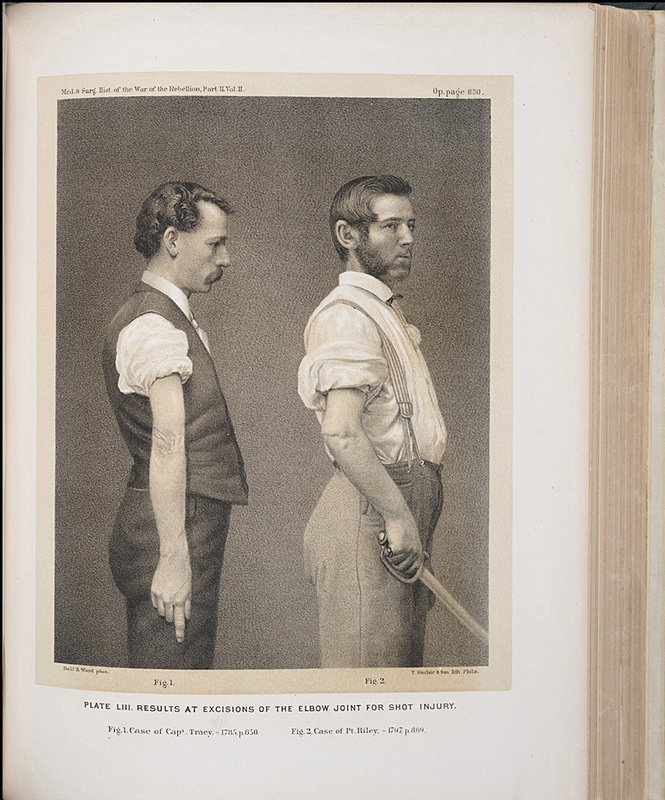 Several images are in the Picturing Words exhibition, but you can “turn the pages” of the entire text at the National Library of Medicine. I love the title page, with Vesalius conducting a theatrical dissection, his face turned to us, the audience and readers, as well as the artfully placed skeletons and body parts. As I am essentially materialistic at heart, the images from the exhibition that appeal to me the most are from the Influence category, as in influencing design and attracting consumers. 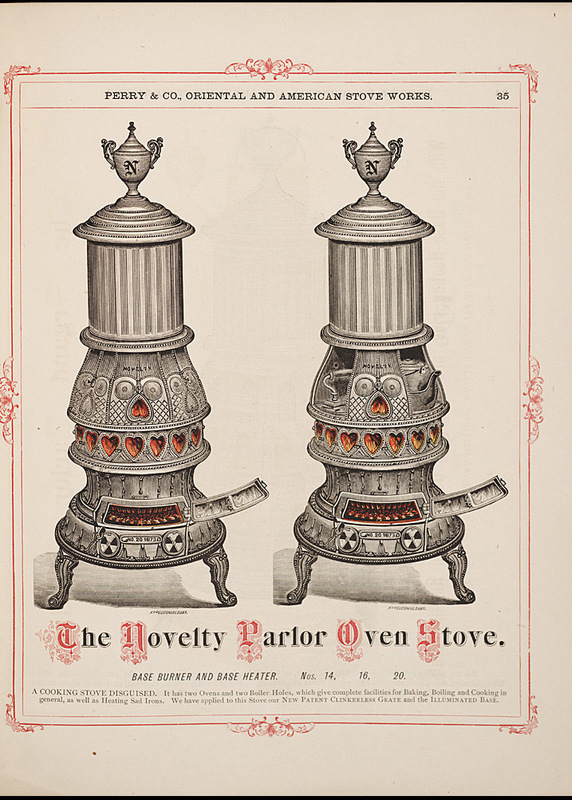 Asher Benjamin’s Practical House Carpenter has always been a favorite source for architectural images, and even though I’m about a century late for these particular products, I am quite drawn to these stoves and shoes. It’s important to remember in this digital age that print was at least as important to the Consumer Revolution as it was to the Scientific Revolution. 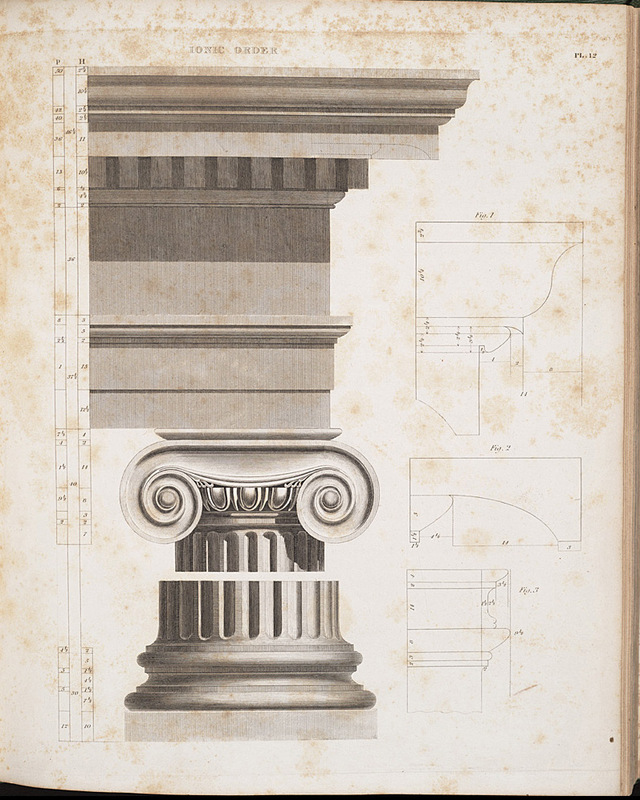 Columns, stoves and shoes: images from Asher Benjamin’s The Architect; or, Practical House Carpenter, Boston: B.B. 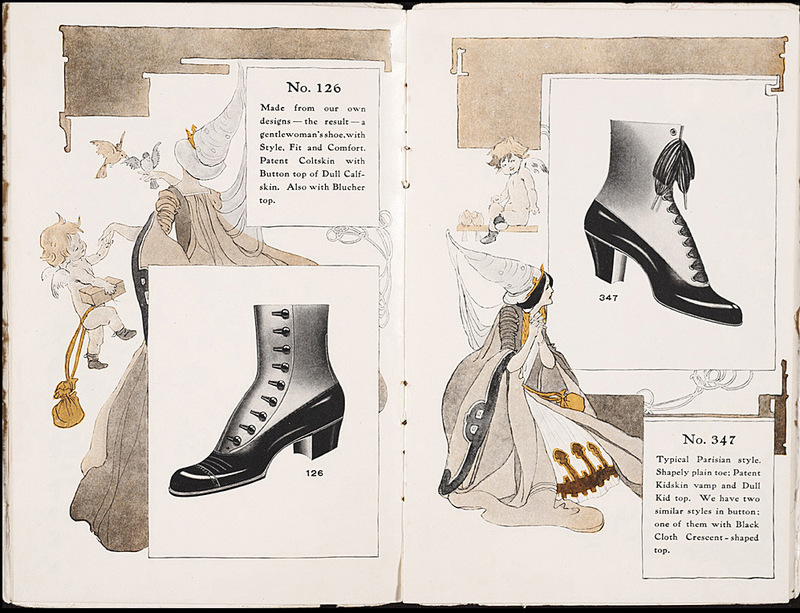 Mussey, 1853; Oriental and American Stove Works, Perry & Co., New York: The Van Benthuysen Printing House, 1874; Queen Quality Smart Shoes, Thomas Plant Co., Boston, 1910. My last image is from the Inspiration section, but I have bypassed the medieval religious texts in favor of a page from David Pelletier’s The Graphic Alphabet (1996). 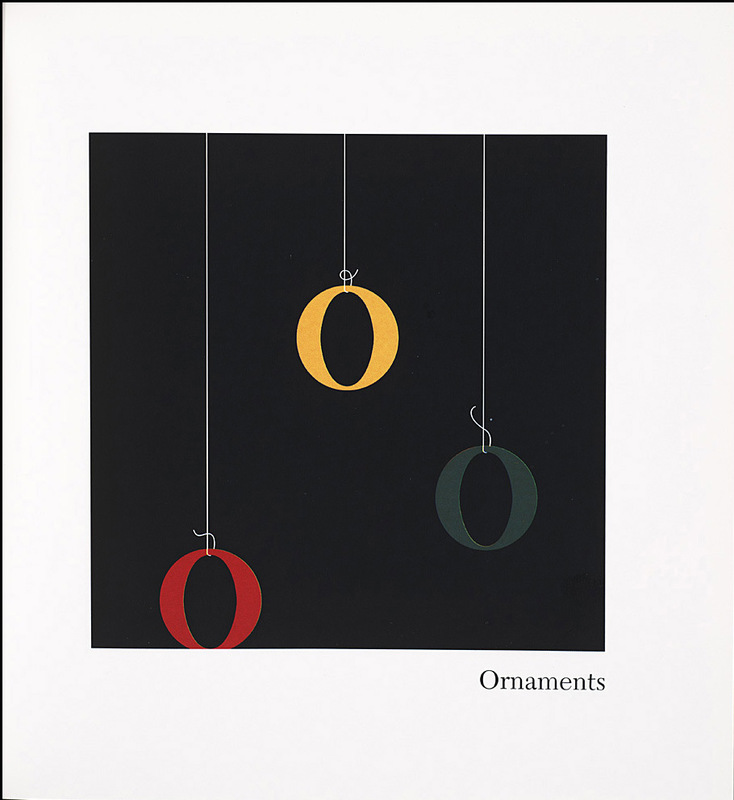 The link between the two is through the use of letterforms as illustration, an interesting feature of the exhibition: ornamented capitals in the past, letters as ornaments in the present. David Pelletier, The Graphic Alphabet. New York: Orchard, c. 1996. My family does not have a long list of veterans in its present or past, so Veterans Day has always been a bit abstract for me, or just the tail end of another long weekend. I’m as patriotic as the next person, so I always try to think about war, service, and loss on the actual day, but my thoughts are not particularly personal, and consequently, not very heartfelt. I must admit that several Veterans Days have been “observed” by watching marathons of war films on Turner Classic Movies, or, even worse, going shopping! This year, however, I am more thoughtful, because I am focused, finally, on my grandfather’s service during World War II. My paternal grandfather, who died in 1996, was a physician who served as a lieutenant in the U.S. Navy Medical Corps from 1943-45. He was the medical officer on board the USS Taluga, which was hit by a kamikaze suicide plane attack in April of 1945, and also worked in a field hospital on the island of Okinawa. I don’t remember him talking about these experiences at great length; his identity was always more physician (and patriarch) than it was veteran. And sadly, I don’t think I really every questioned him about it, in any detail. We recently celebrated the 100th birthday of his wife, my grandmother, and while putting together a photographic presentation of her life, I came across several pictures of Pops in uniform, and finally started to focus on his service. Too little, too late; Nana can answer some questions, and there are letters, but I really wish I had had conversations with my veteran while he was still alive. Since I don’t have the particulars, I’ll be more general; it occurred to me that medical advances are one of the very few positive outcomes of war, both in the past and the present. 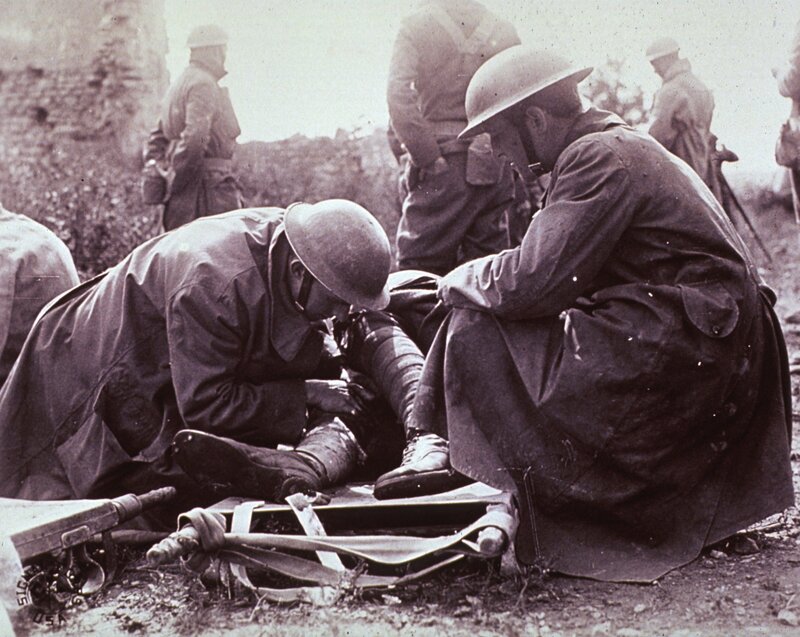 Not only did physicians, nurses, and medics provide essential aid and comfort in the midst of war, what they learned about the treatment of battlefield injuries contributed cumulatively to the advance of medicine after the war. 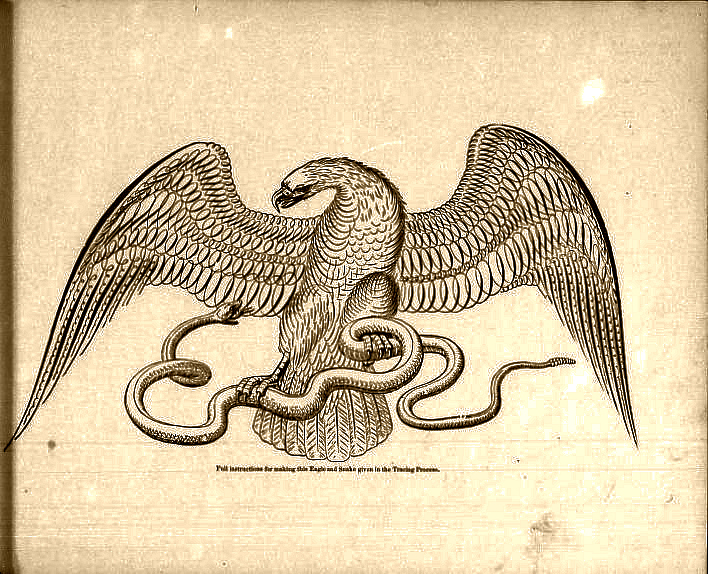 War and medicine have been inextricably linked, through the centuries, and most intensively in last century of total war weaponry and tactics. So my focus for this Veterans Day is on those who healed those who fought. 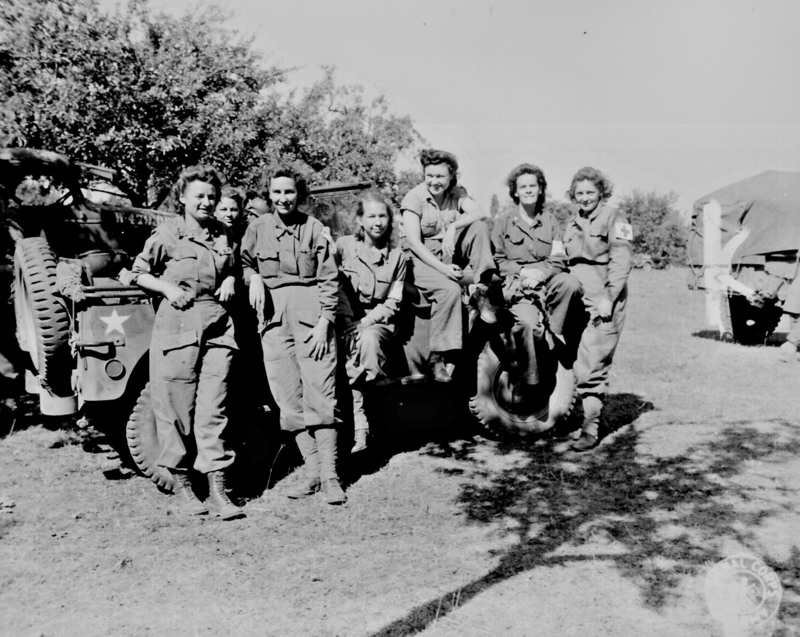 We don’t have any pictures of my grandfather doing his work during the war, and he wasn’t a surgeon, but I think the picture of a wartime surgery in the Pacific theater is particularly poignant, as is the following one of nurses on their way home, for quite different reasons. 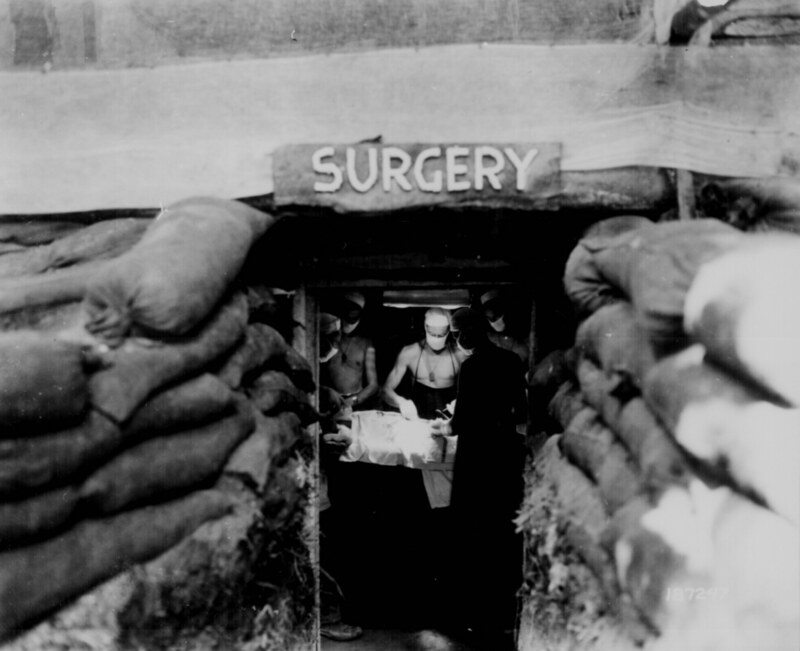 Two pictures from the National Archives: “In an underground surgery room, behind the front lines on Bougainville, an American Army doctor operates on a U.S. soldier wounded by a Japanese sniper.” December 13, 1943; and “Nurses of a field hospital who arrived in France via England and Egypt after three years service.” Parker, August 12, 1944. 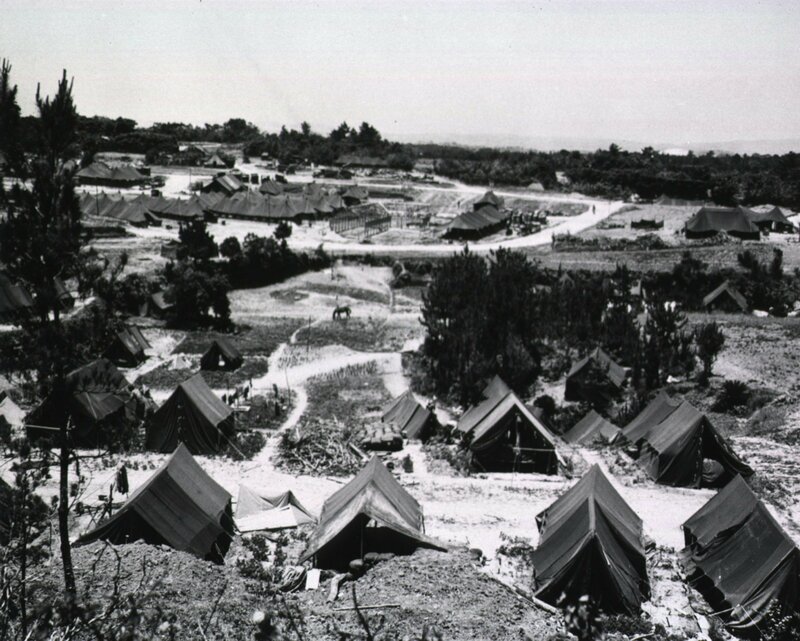 The 9th Field Hospital at Okinawa, 1944, National Library of Medicine. I can’t imagine how the medical corps of World War I dealt with military innovations of this “great war”, the gas, machine guns and trench warfare for which they had no reference. And then the aftermath: the legions of amputees, disfigured, and disabled veterans who would require treatment, rehabilitation, and aid long after the war was over. The interwar era saw unprecedented advances in medicine due to the military medical professionals who rose to these challenges. 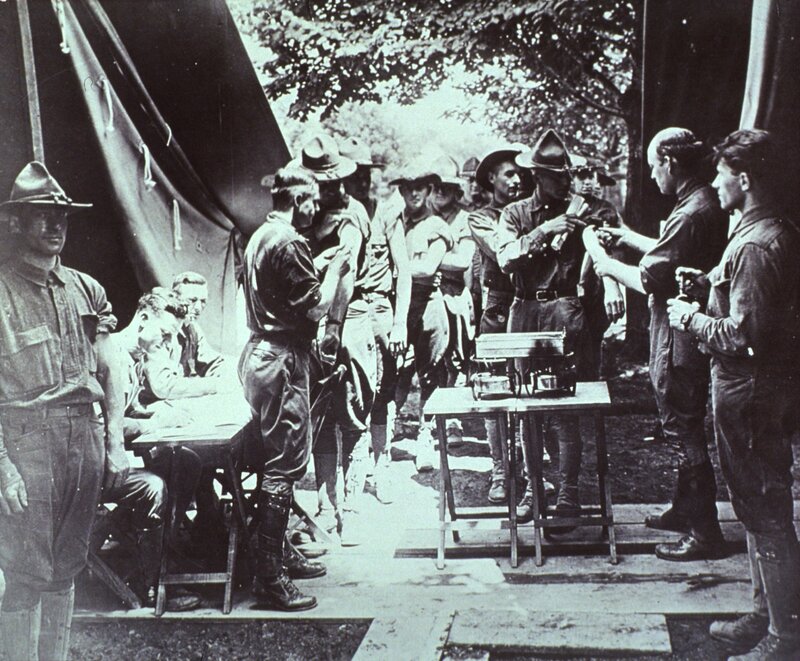 Military medicine came to benefit not only those who served, but also society as a whole. 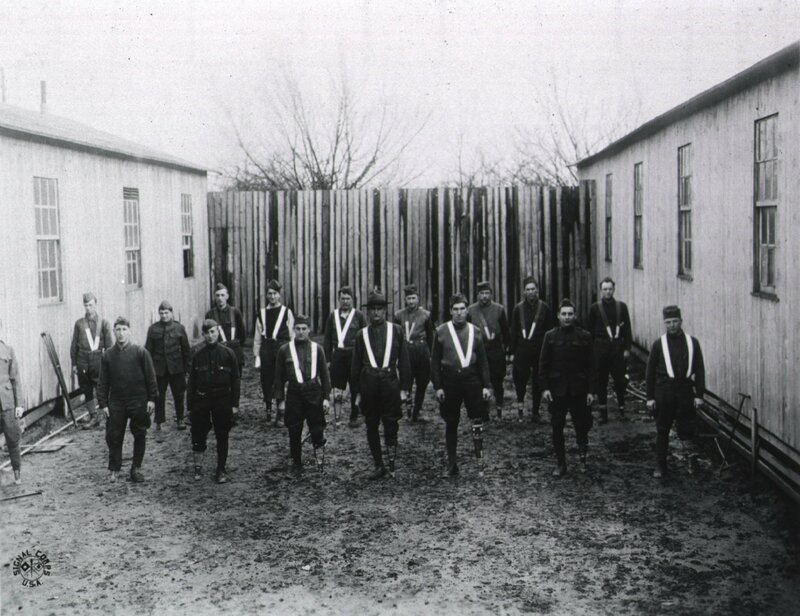 Scenes from World War I and after, from the National Library of Medicine: an American ambulance corps at work in France, typhoid vaccinations, and “above knee amputation with peg legs reconstruction class”, 1917-1919. I could show you picture after picture of injured and mutilated veterans of World War I; their sacrifices were documented by the medical corps for the greater good. Clearly the nature of the injuries sustained in the Great War was unprecedented but the inclination to learn from such suffering was not: Civil War injuries were documented as well, by battlefield physicians who were no doubt overwhelmed by the circumstances they found themselves in, and after, by their colleagues who were attempting to learn from the recent past–and probably prepare for the future. 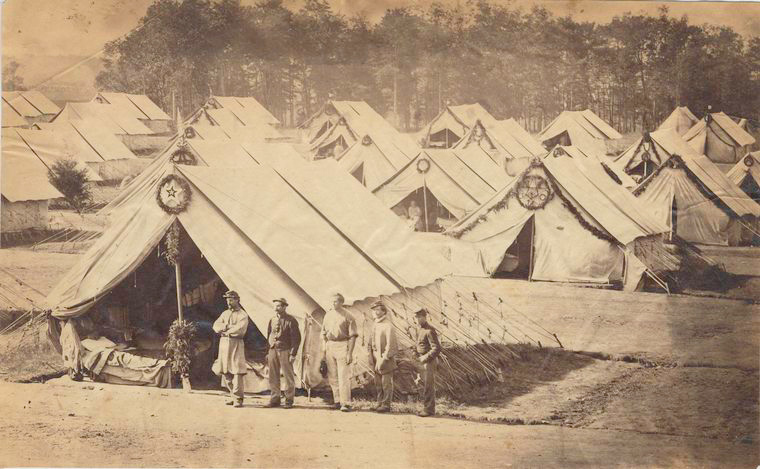 U.S. Sanitary Commission Hospital at Gettysburg, 1863, New York Public Library Digital Gallery; page from The Medical and Surgical History of the War of the Rebellion, 1861–65, United States Surgeon General’s Office, 1870-88: from the Smithsonian Institution Libraries’ Digital Exhibition “Picturing Words: the Power of Book Illustration”. 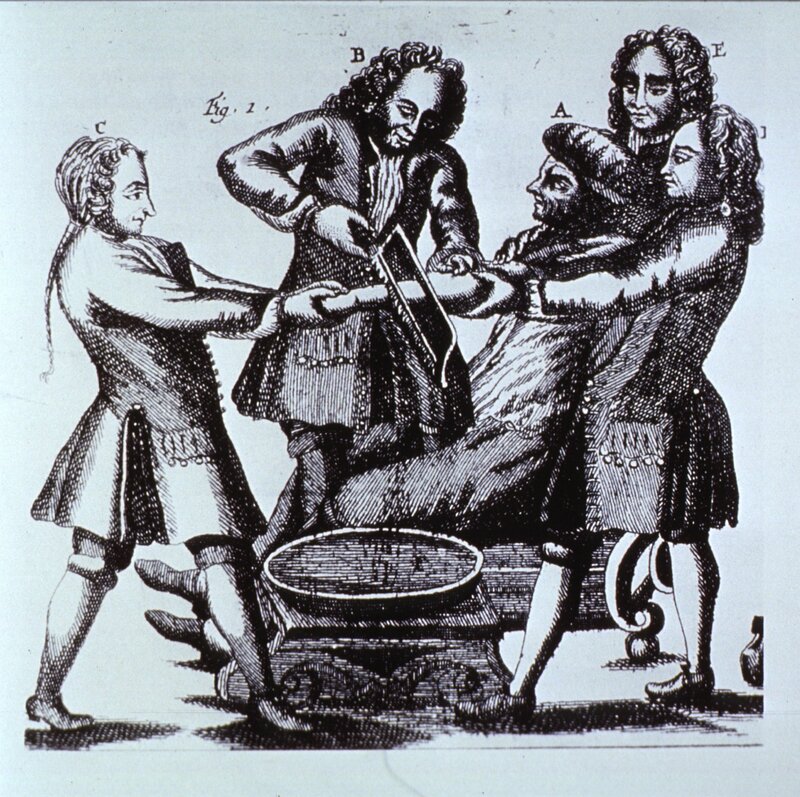 The history of military medicine certainly doesn’t begin with the Civil War; I could trace battlefield physicians back to the Renaissance and certainly there were countless, anonymous nurses on the sidelines over the ages. But the futility of their efforts in the face of war is important to note: more soldiers died of disease and battlefield surgeries than combat injuries until World War I. So I’m going to end with a physician who offered even more than his professional skills and expertise in service to his country: Boston’s own Dr. Joseph Warren, who died fighting in the Battle of Bunker (Breed’s) Hill, galvanizing the will of his fellow patriots. 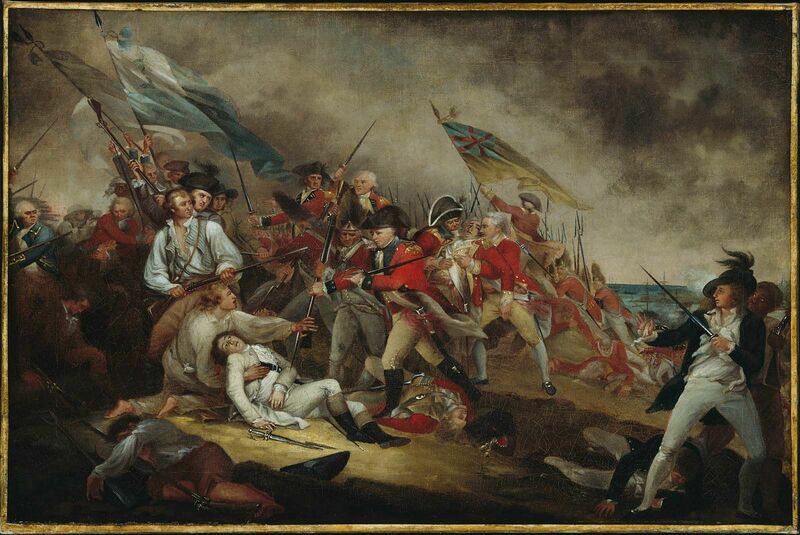 An illustration from Heisters Surgery (1768), National Library of Medicine; John Trumbull, The Death of General Warren at the Battle of Bunker Hill, 1786, Museum of Fine Arts, Boston. I have long been fascinated with printing in all its forms, and became acquainted with the work of the Pendleton Brothers of Boston when I was researching a long-lost Derby house here in Salem. The daughter of the house, Mary Jane Derby, entrusted her beautiful painting of it to William and John Pendleton, and they produced an equally beautiful lithograph with their cutting-edge process. This print led me to other prints, and explorations in the vast collections of the Boston Public Library and Boston Athenaeum. There is something about the Pendleton’s work, particularly their images of buildings, that I find really captivating: it’s almost photographic, but not quite; it is both realistic and romantic at the same time. 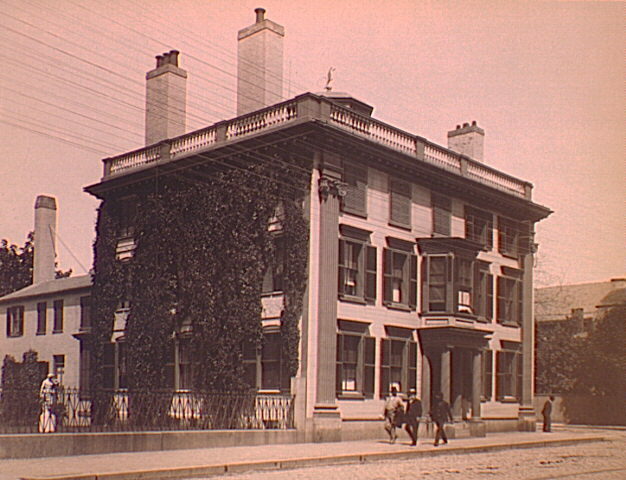 Here is the Derby House, now the site of the Masonic building on busy Washington Street, along with several other lost Salem houses, preserved forever by the Pendletons. These prints of famous Salem houses, all from the collection of the Boston Athenaeum and all gone, were produced by the Pendleton shop in the 1830s, early days in the history of lithography. The Derby house was taken down around 1915, after its Washington Street neighborhood had transitioned from residential to commercial. In the center, the Benjamin Pickman house was built around 1748 and taken down at the beginning of World War II, when it was in a dilapidated state. 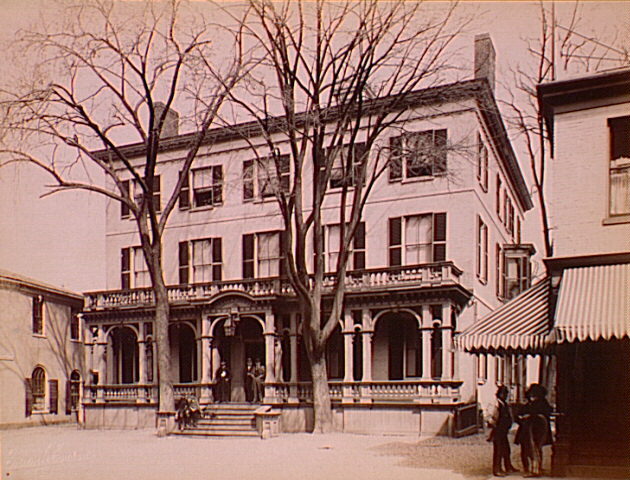 The “Lafayette Coffee House”, built after 1796 as a residence for the famous Salem merchant William “Billy” Gray, lasted until the 1970s, though it was unrecognizable at the end. The perennially-unsuccessful East India Mall/Museum Place/parking garage was built on its site. This post isn’t really about these houses or their unfortunate destruction, but I can’t resist showing images of their later incarnations, strong contrasts to the Pendletons’ pristine structures. 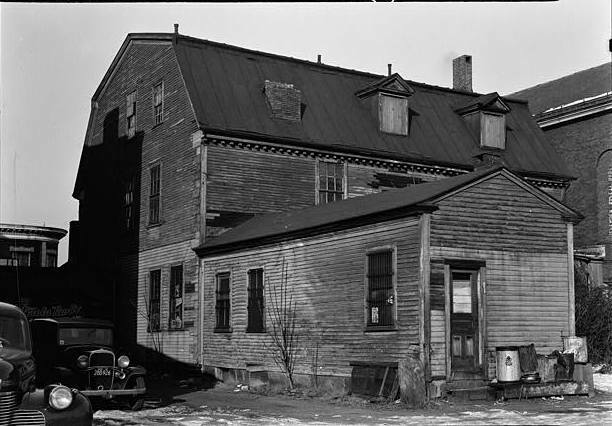 Two Frank Cousins photographs of the Derby and Gray (Lafayette Coffee House & later the Essex House, a hotel) houses, Duke University Library, and in the center, a HABS photograph from 1940 of the rear of the Pickman House, Library of Congress. The Pendleton Studio in Boston was not in operation for very long (1825-1836) but nevertheless it seems to have been quite influential, both in terms of technology and the fostering of a community of artists, most prominently Fitz Hugh Lane. 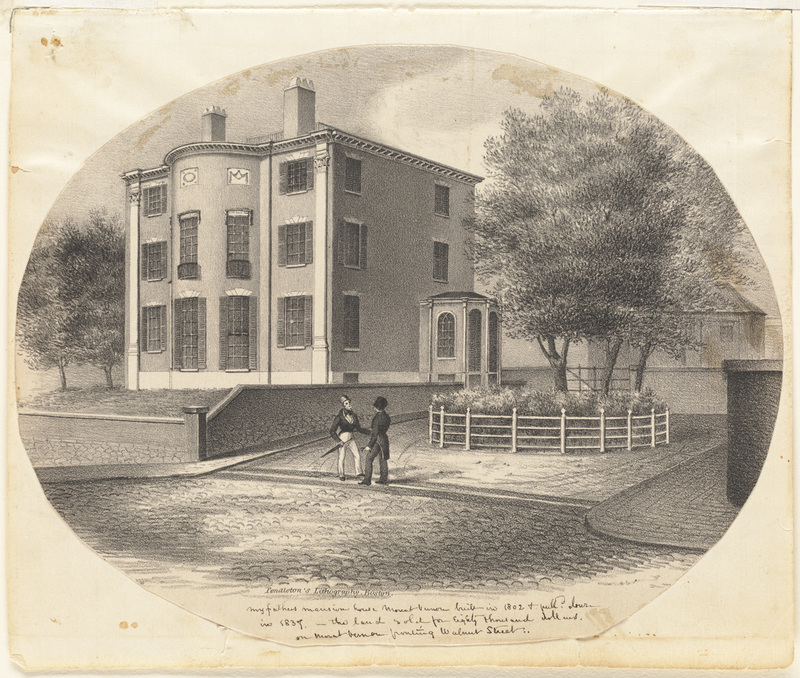 Their images of Boston–individual buildings, wharves, streetscapes–demand a dedicated post, but I’ve got to sneak this lithograph of the Jonathan Morse house in Boston in here, because it is so charming, beautiful, Bulfinch, and sadly, long gone. Jonathan Mason House: Mt. Vernon and Walnut Streets, Boston. House built 1802, razed 1827. 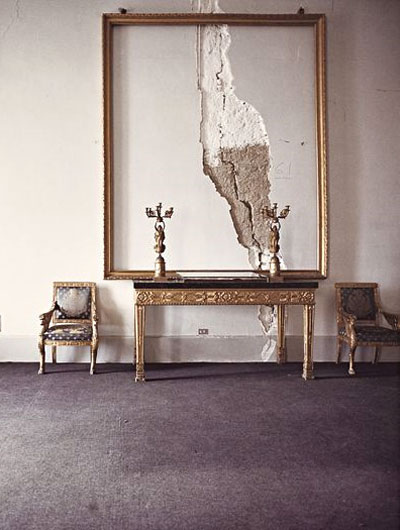 C. Bulfinch, arch. Boston Public Library. The Pendleton brothers were businessmen, and they didn’t just produce single-commission images of the region’s notable houses. 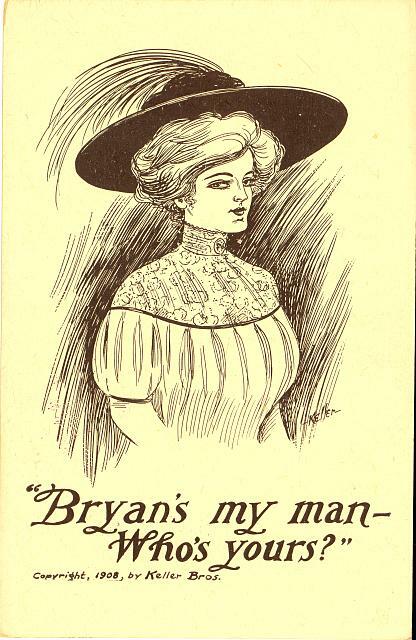 Their oeuvre includes advertisements, song sheets, portraits of the well-known and the well-heeled, and curiosities, for lack of a better word. But they were not job printers, by any means. 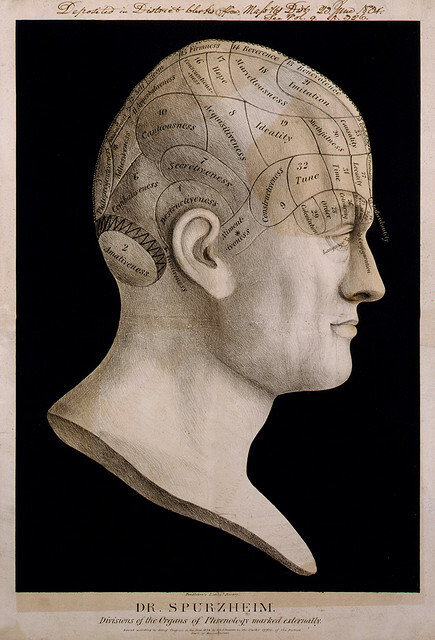 Two more humanistic examples of their work (well, in a way), and images that they themselves submitted to the Library of Congress are a phrenological chart based on the popular theories of Dr. Johann Spurzheim, founder of the phrenology craze that spread across America in the nineteenth century, and a print of Rembrandt Peale’s portrait of George Washington. 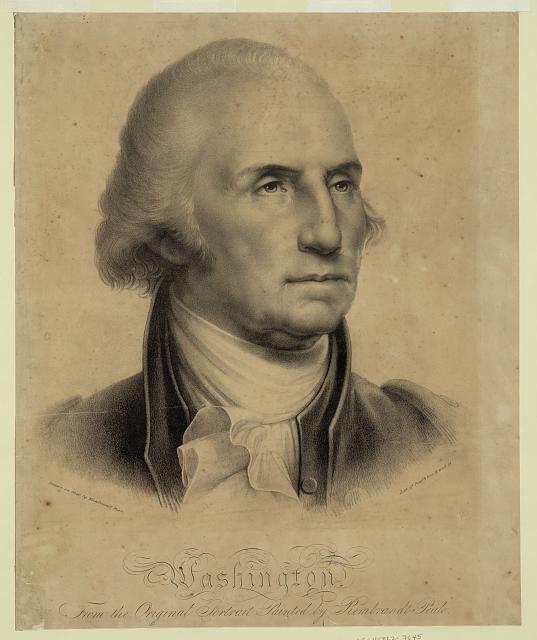 Pendleton’s Lithography prints from the Library of Congress, 1832 and 1827. I am so very grateful that Election Day is finally upon us. I’ve been living in a world of division over the past many months: divided family, divided household, divided department, divided circle of friends. Facebook has been absolutely unbearable in the last month or so–even more so than normal. Hopefully we can all move on no matter what the outcomes. All this early voting confuses and upsets me: I think it’s adding to the divisiveness. Why can’t we just have one day, Election Day, when we all exercise our civic obligation and privilege at the same time? If it’s a matter of access and opportunity, I would certainly support an Election Day holiday, but I think we should all vote on the same day and then celebrate our ability to vote on Election Night. I’m very curious about the experience of voting in the past, and the speed by which news of the results reached the electorate. Few of my Americanist colleagues could give me any satisfactory insights into this, and my own knowledge of early modern Europe–and age when kings and queens ruled–is not much help. 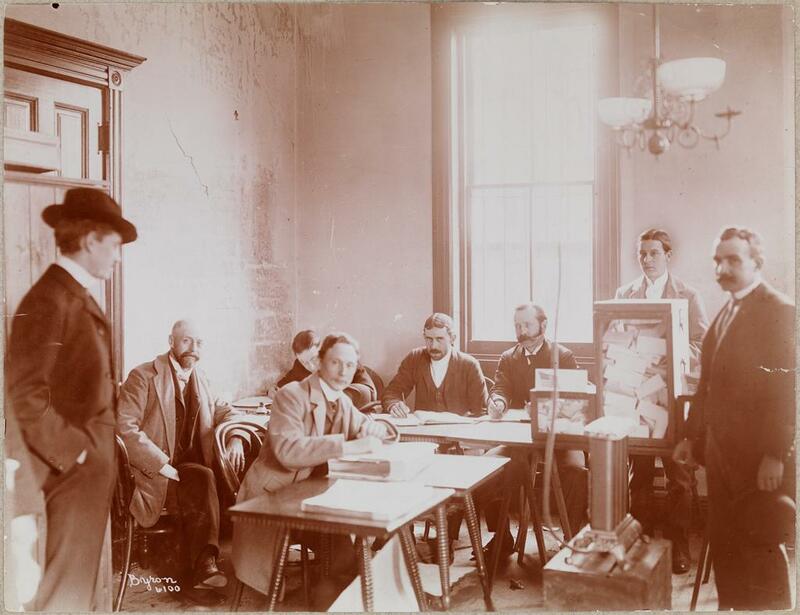 I imagine that the experience of voting was very different in the cities and the countryside, and that it took weeks, if not months, to know the results before the telegraph and telephone. 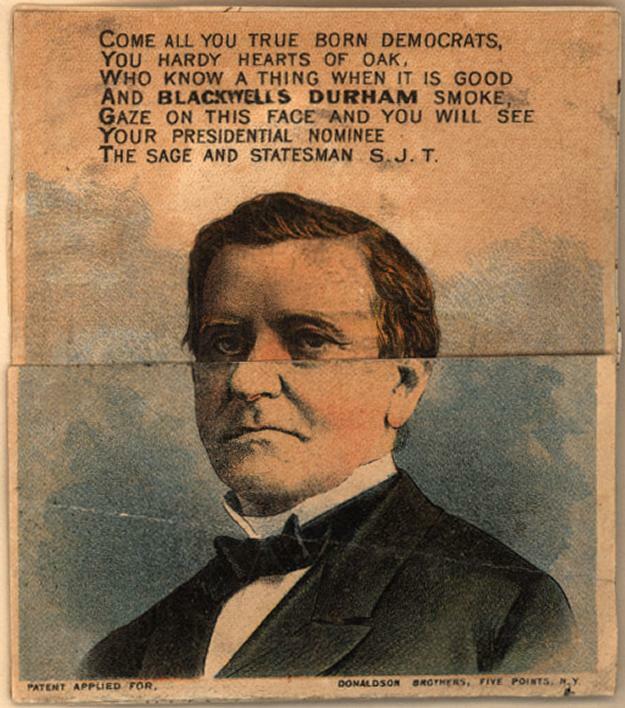 One colleague suggested we search through a database of early American newspapers to see when the election results reached Salem, and our findings were both predictable and surprising: predictable in the sense that it clearly took several weeks to confirm the election of a president through most of the nineteenth century, surprising in the way they voted–over several days. So there goes my criticism of the supposed “innovation” of early voting. 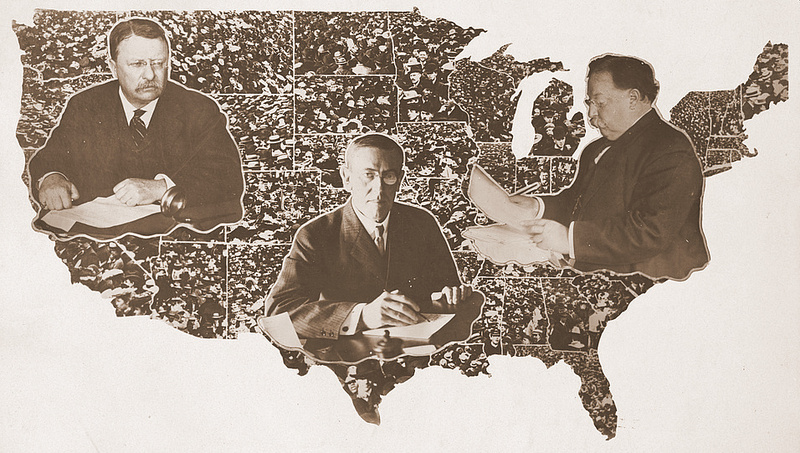 The logistics of democracy are often complicated, then and now. 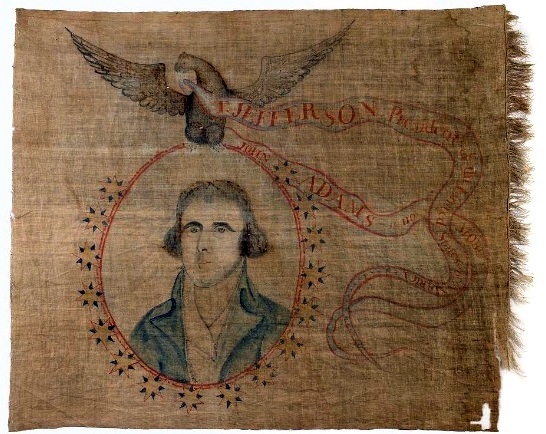 My research into the mechanics of voting did turn up some great election materials, from a succession of campaigns and elections past, beginning with a lovely banner from one of the most contested elections of all time: the 1800 race between Thomas Jefferson and John Adams. I love this banner from the Smithsonian, and wonder where it was displayed. 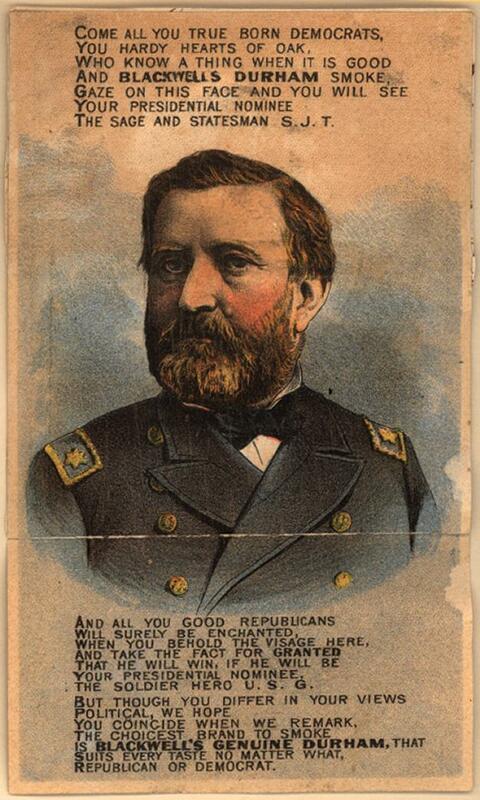 My election images are a mixture of materials: from campaigns and periodicals primarily. I would have liked to get inside the polling place, or on the streets just outside, but that was seldom possible. And I’m not even getting close to the present: too divisive. The past is safer. 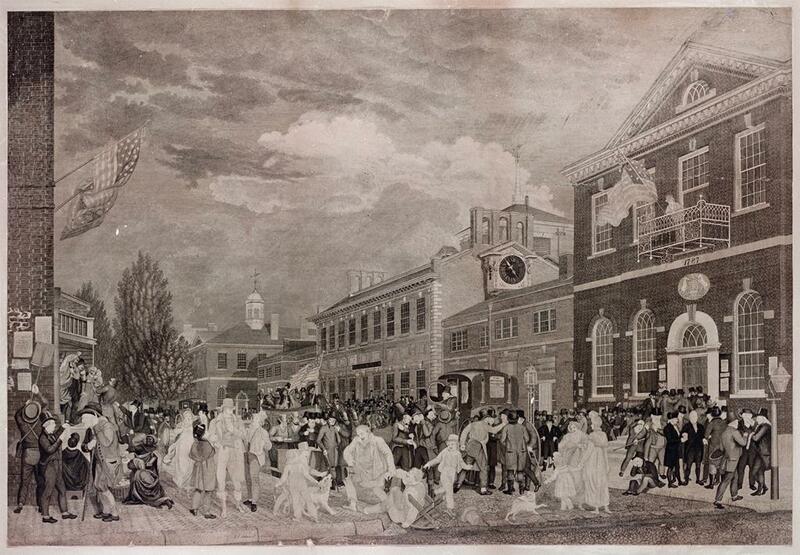 Two very popular prints: Election Day outside Independence Hall, Philadelphia, 1816, by Alexander Lawson, and James Polk trying to prove he is not pro-Catholic, 1844, both Library of Congress. 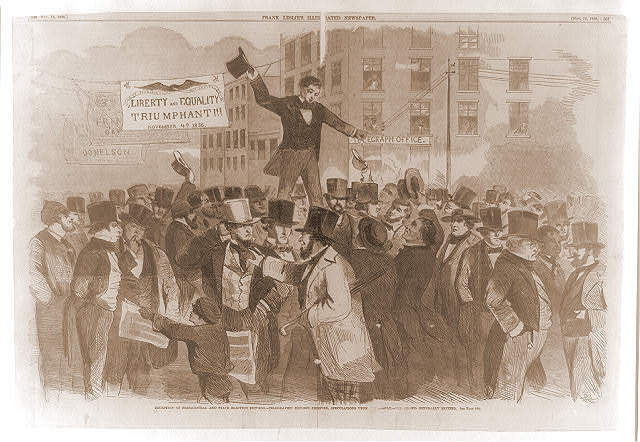 The telegraph delivers the results of the 1856 election & a Charles Maurand print of the celebrations following the election of Abraham Lincoln in the streets of New York, 1860, Harper’s Weekly; a metamorphic trade card for the presidential contest of 1876 between Tilden and Grant, Duke University Library Special Collections. 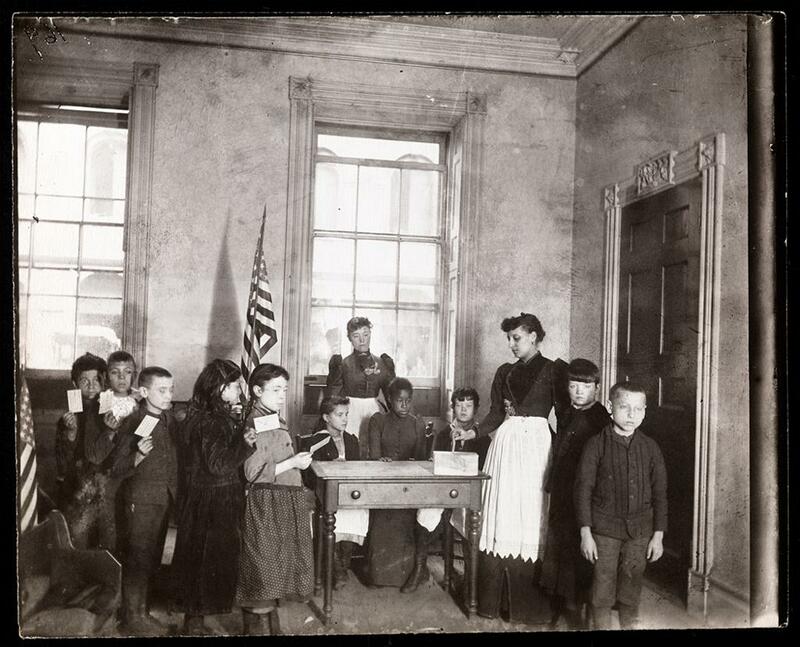 Inside the Polling Place: voting in New York City, 1898 and a Jacob Riis photograph of a mock election, 1890, Museum of the City of New York. 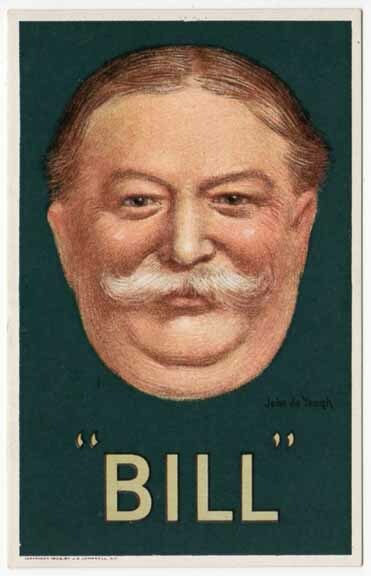 The emergence of public opinion: campaign cards for William Howard Taft and William Jennings Bryan from the 1908 election–before women could vote, of course, and a nation divided between Roosevelt, Wilson and Taft in 1912, Library of Congress. Tonight is Bonfire Night, the age-old celebration of the thwarting of the 1605 Gunpowder Plot, a native Catholic conspiracy to blow up the entire English government–King James I and VI and the royal family, attendant Lords and legislators–at the opening of Parliament. 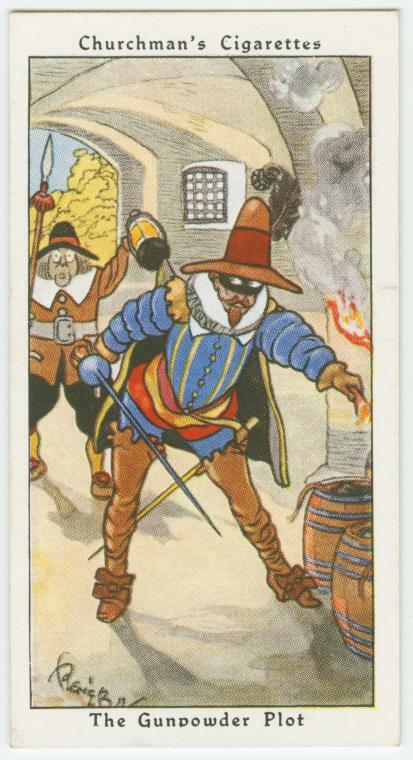 Plans of the plot leaked out, and Guido (or Guy) Fawkes, the man who has come to symbolize the Plot and recently so much more, was found in the basement of Parliament with 36 kegs of gunpowder. 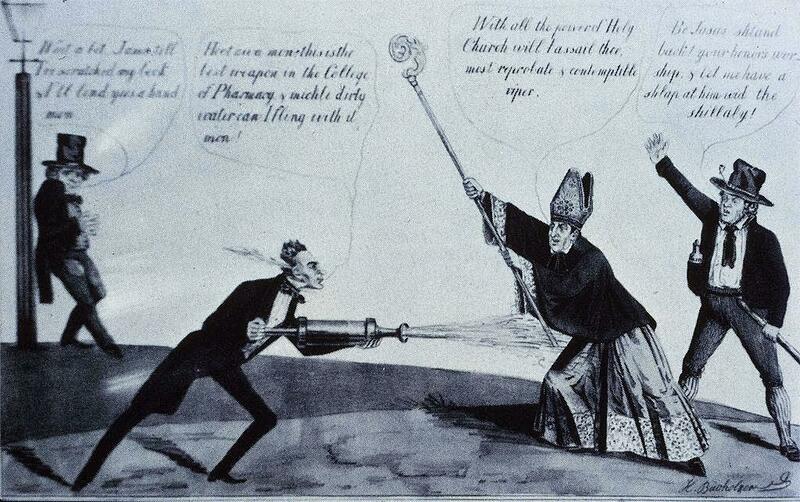 In the days that followed, he confessed to the Plot (both under torture and afterwards) and named the others involved. 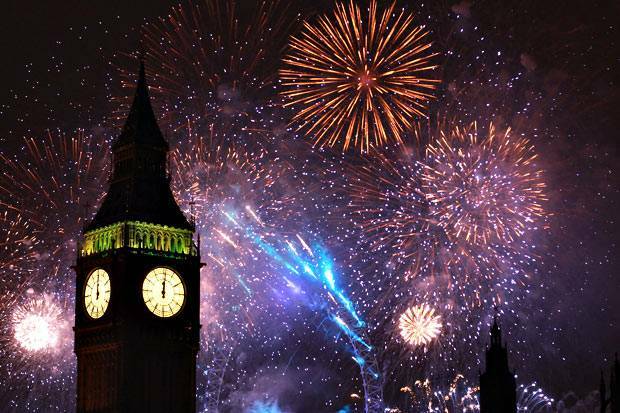 Not long after 1605, the relatively new art of fireworks was merged with the traditional celebratory British bonfire and burning Guy effigies to create a truly incendiary evening. 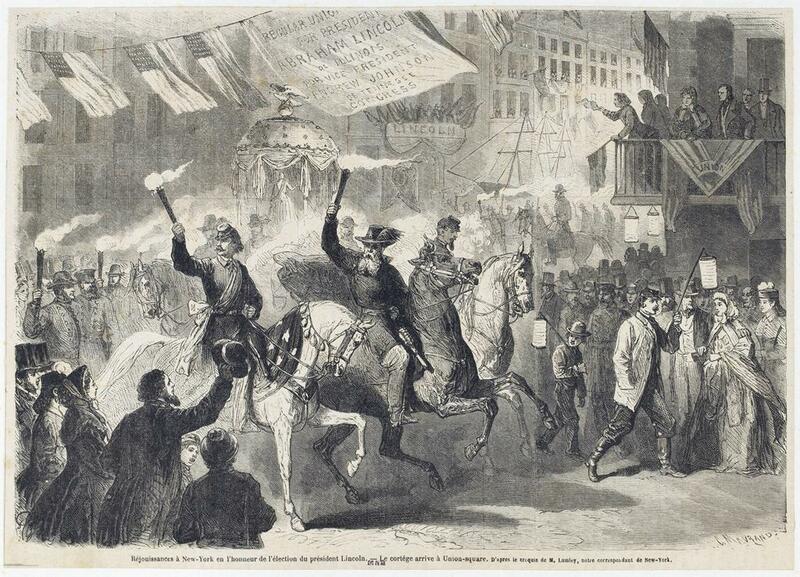 And the tradition has continued for over 400 years–it looks like they already started this weekend. 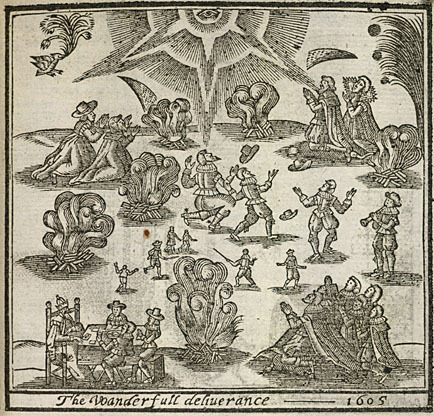 Celebrating the “wonderfull deliverance” in 1605 and last year. The Plot and its aftermath have so many interesting dimensions: historical, cultural, political. I’m going to focus on just a few in this short blog post, but obviously books can and have been written. 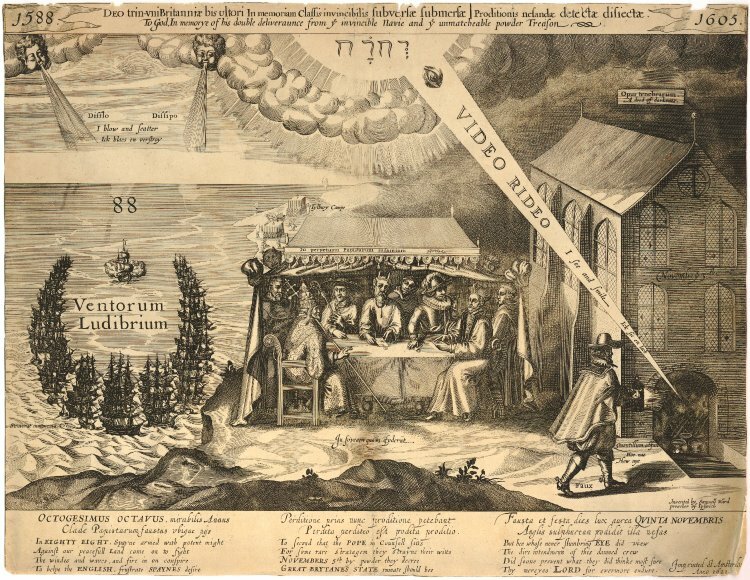 For teaching purposes, nothing demonstrates burgeoning popular anti-Catholicism in England better than the Plot and all of the diverse reactions and expressions that came after, as demonstrated particularly by the broadside below, which connects the attack of the Spanish Armada in 1588 with the Plot through a nefarious council jointly overseen by the Pope and the Devil. 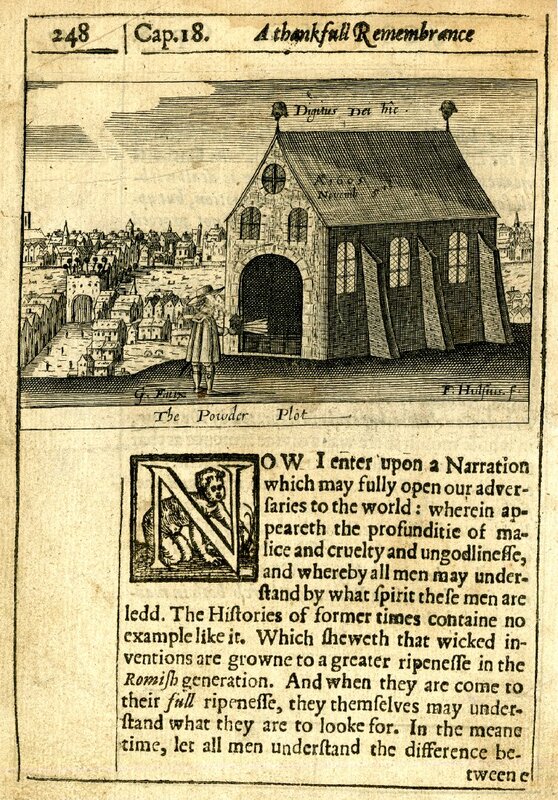 Religious propaganda in seventeenth century England was not subtle, but subtlety is not what you need to convey religious intensity, both negative and positive, to twenty-first century college students. And then there is the culture of remembrance and the shaping of national identity. Modern historians have focused on this trend, particularly in relation to the Civil War in America and the First World War in Europe, but I think we can push it back into the early modern era. 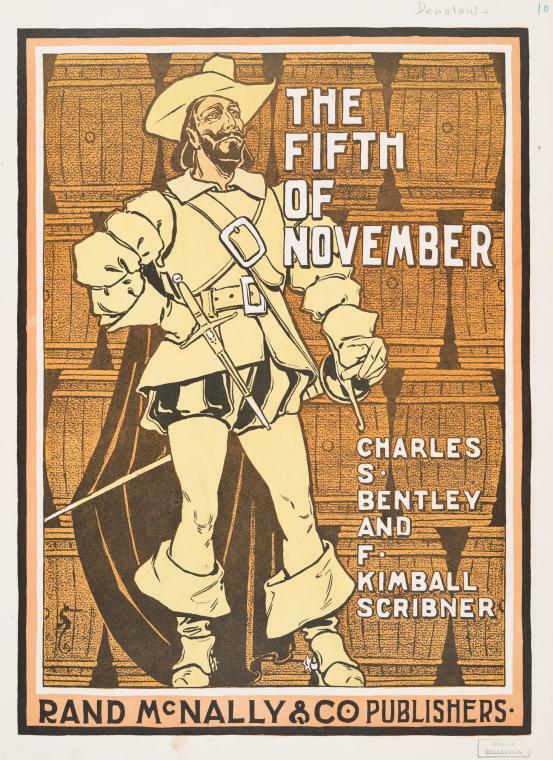 The Fifth of November was definitely and deliberately cultivated as a day of national deliverance and remembrance in England, and later in Great Britain, the Empire, and the Commonwealth. 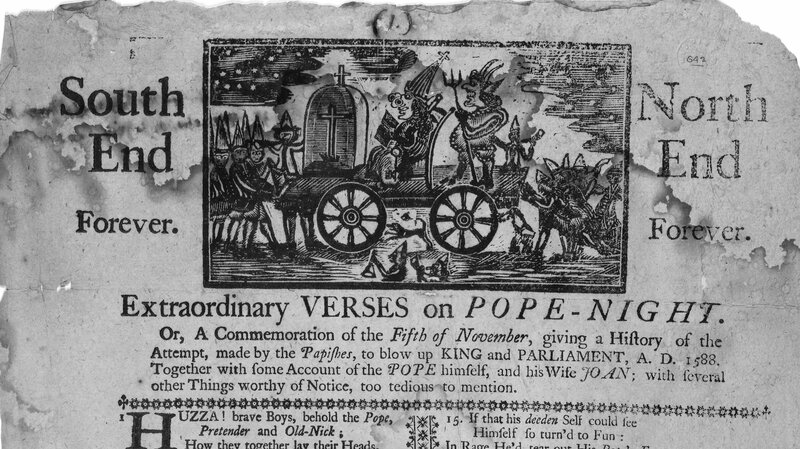 Here in New England, the 5th of November was celebrated as “Pope-Night” until the onset of the Revolution, and then it had to stop, or change, as it was just too British. 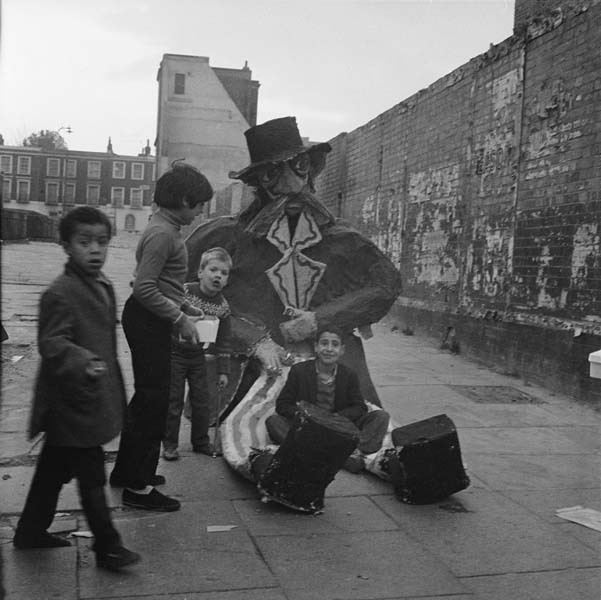 Being British meant remembering the 5th of November, even if it was increasingly shed of its specific religious associations. 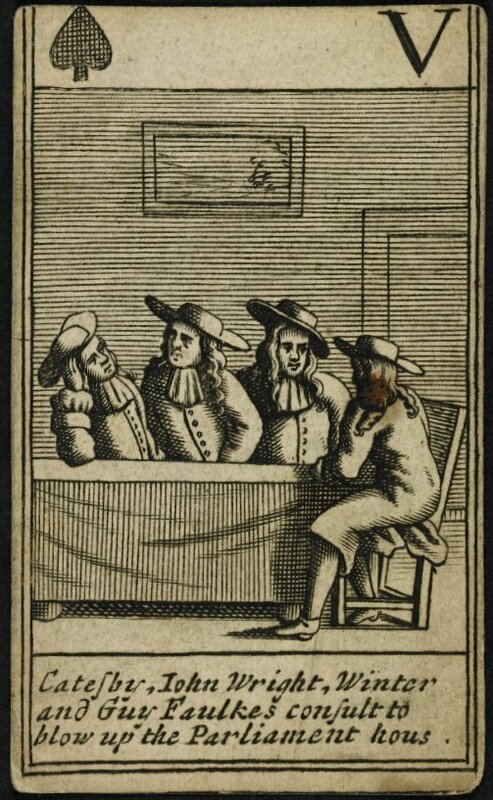 Illustrations from George Carleton‘s A Thankfull Remembrance of Gods Mercy, London, 1627, British Museum and from Extraordinary Verses on Pope-Night, Boston, 1769, Library of Congress. 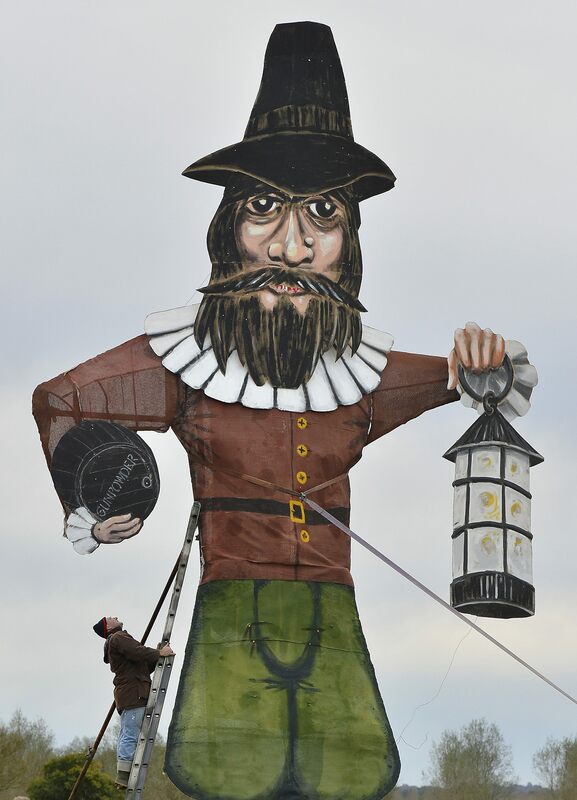 Obviously it’s all about Guy Fawkes, then and now: Bonfire Night is Guy Fawkes night. As I wrote about in last year’s November 5th post, Fawkes has gone through an amazing transition, from terrorist to liberator, due to his central role in the graphic novel and film V for Vendetta and his adoption by the global Occupy movement. Guy miraculously became an advocate for freedom and an avatar for the 99%, with Shepard Fairey reworking his famous Hope poster with the mask of Fawkes replacing Obama. This transition seemed rather abrupt to me a year ago, but I’ve looked at Guy’s evolution over the centuries a bit and now I think I understand: he has lost his context. 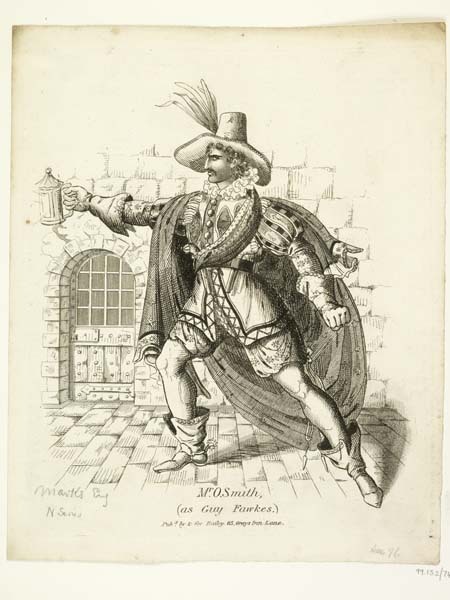 Shed of the conspiratorial motivations and details, he became an increasingly iconic image, and also somewhat of a dashing cavalier. 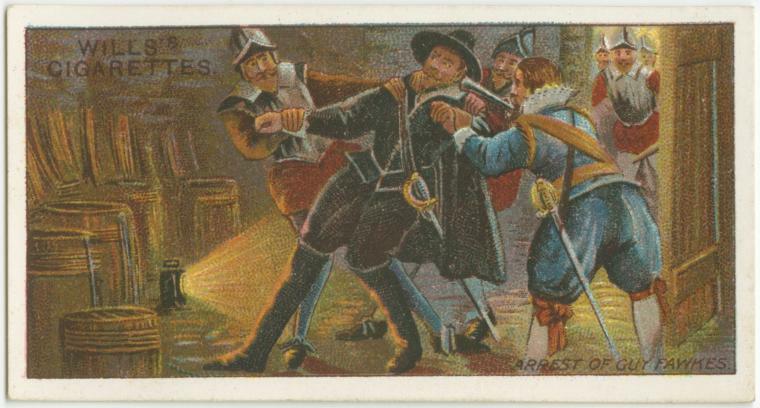 Guy through the ages: a Gunpowder Plot card from a deck of “Popish plot” cards, 1672, British Museum; an actor in character and costume as Guy, 1830s, Museum of London; cigarette cards from the 1920s and 1930s and a W.W. Denslow poster from the turn of the century, New York Public Library Digital Gallery; boys in Camden Town, London, with their Guy effigy, c. 1970, Museum of London; putting finishing touches on a Guy effigy this past weekend, Reuters.